I knew I wanted to participate in Inktober the moment I heard about it, but I wasn't sure I'd be "ready" in time—or if I would be too busy by October. So when September rolled around, I decided to pretend my busy schedule was manageable and just dove into the planning. After participating in MerMay *cough, cough* and only posting 11 out of the 31 days, I knew I had to keep my personal Inktober goals reasonable. So unlike MerMay, I decided to follow the official challenge prompt list to stay motivated and inspired to create. 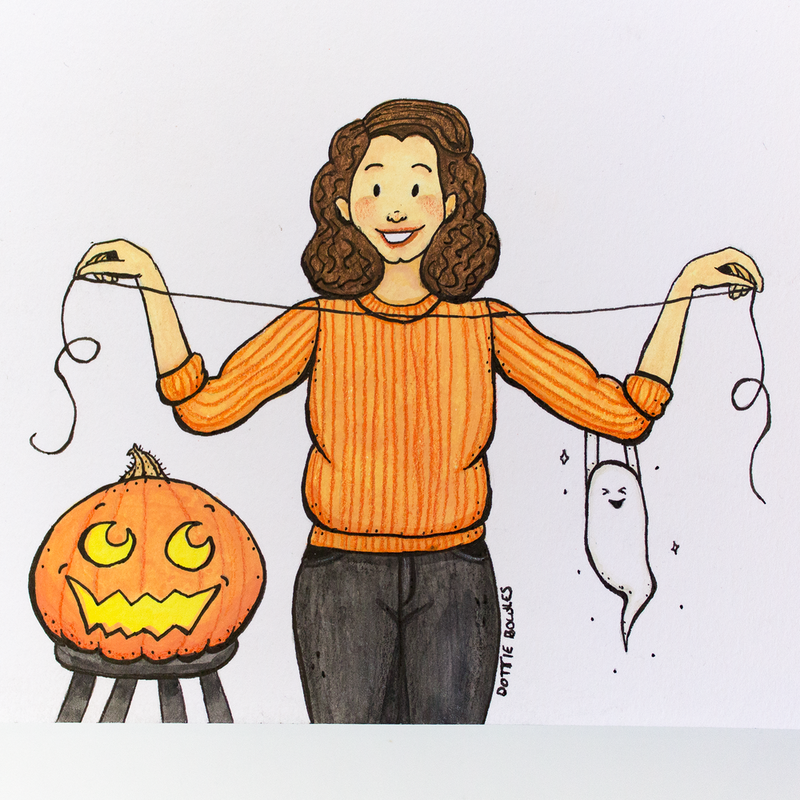 I think a big part of what helped me finish strong was choosing to do smaller illustrations as well as utilizing a personal theme of pumpkins / jack-o-lanterns. They gave me a simple subject and easy jumping off point for each prompt. Although Inktober is a challenge centered around improving your inking (+ digital inking) skills, I wanted to simultaneously improve my inking with gouache or watercolor. I took some time to play around with different mediums and approaches to see what I liked. I ended up loving the look of the gouached pumpkin, so I mixed up a pallet of colors to help me save time during the challenge and continued planning. Essentially everything I ended up using for Inktober (pictured below): Pencils (they all started full size but the broken one had a tendency to break during sharpening). Pencil sharpener. Kneaded eraser. Regular eraser. Holbein gouache primary color mixing set. An old size 1 brush for mixing colors. A size 3 brush. A size 2 brush. Micron pens 01, 03, and 05. Prismacolor colored pencils: white, orange, pink, poppy red, crimson red, apple green, grass green, sienna brown, dark brown, and black. A ruler. I sketched out a week and a half worth of prompts, before Inktober started, to get the ball rolling. Once I had those covered, I focused on each week ahead at the weekend. For each prompt, I sketched an idea, re-drew the design in my mixed-media sketchbook, gouached it the night before, then inked it on the morning of the prompt. Later, I started using colored pencils and would add that after the ink dried. 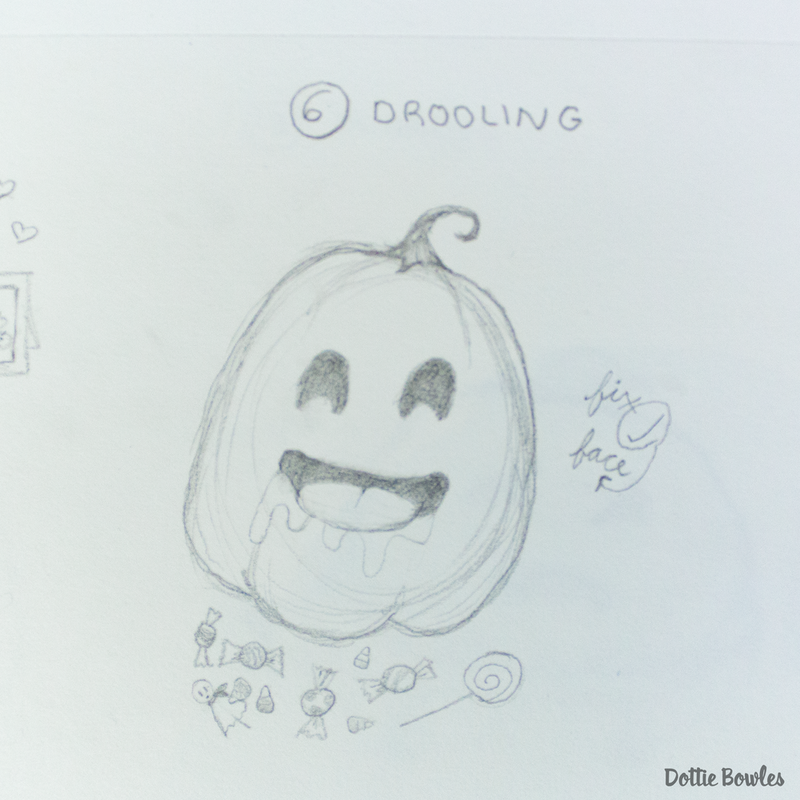 I knew I was making pumpkins before I knew I was going to follow the official prompts so the two pumpkins on the far right (below) were practice. 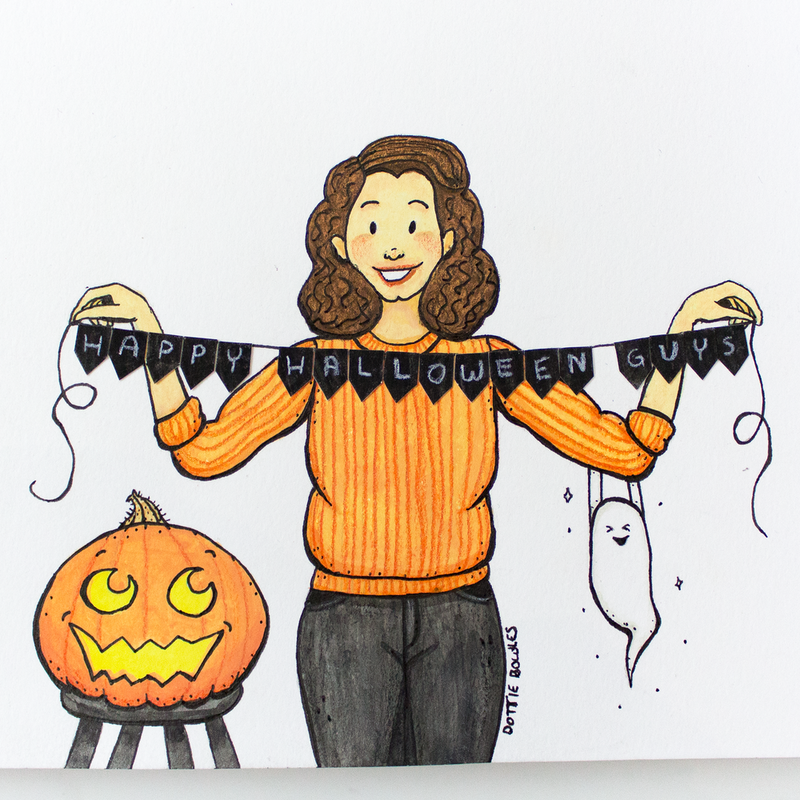 I ended up changing my mind on this sketch and went with something that felt like it would be easier and more ‘on theme‘ with the pumpkins. 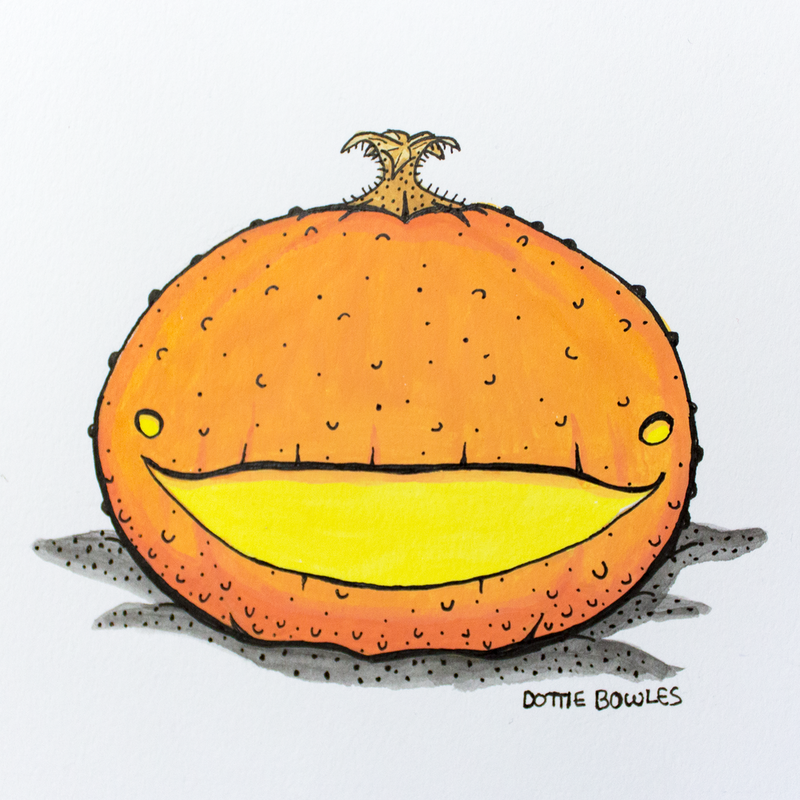 I wasn’t feeling the initial idea of little pumpkins being weighed down by a huge candy bowl so at the last minute I sketched a sick pumpkin and went with it. I was having trouble with this prompt until Adam suggested pumpkin spice cologne! "Breakable" originally made me think of a smashed pumpkin, but I couldn’t bring myself to smash one of my pumpkins—as silly as it sounds. 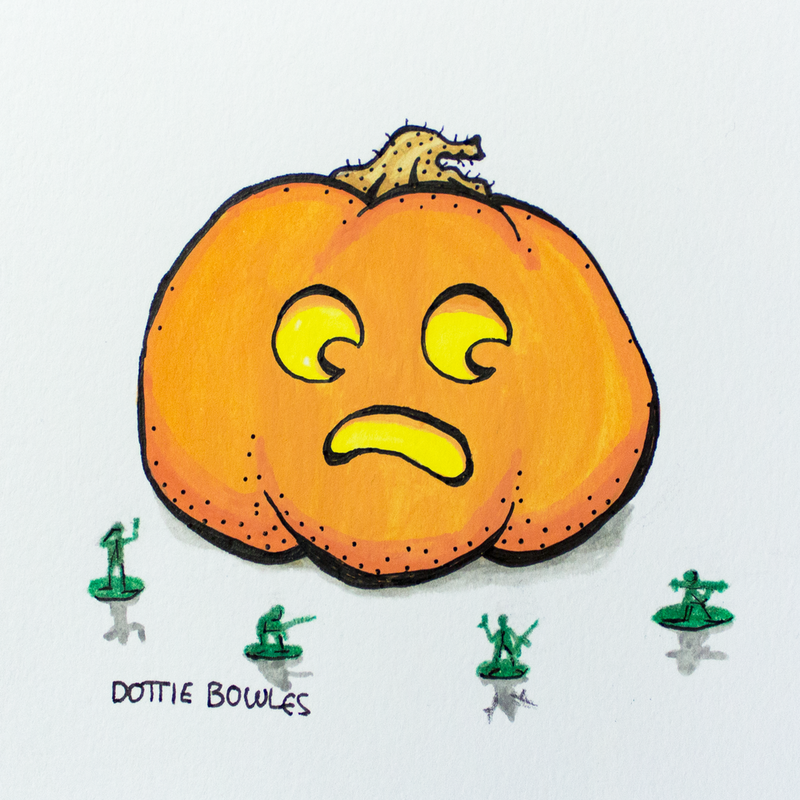 Then I thought about making a pumpkin who collects glass figurines, but it didn’t feel Halloween-y enough. Plus, I wasn’t confident in making them look like glass. In the end, a broken vase with the little ghost coming out sounded exciting so I went with that. “Gift” and “Double” are meant to be the same illustration but flipped! 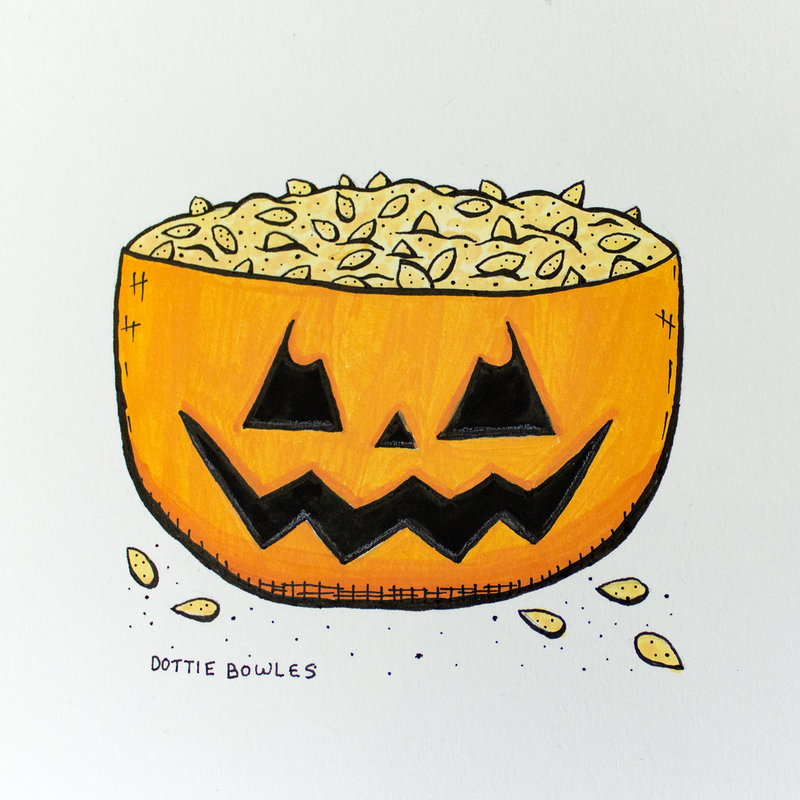 I can't believe Inktober is over already! It went so fast! I already miss waking up and inking every day! I'd love to participate again next year. If you're thinking of joining next year and it's your first year I highly recommend you make a plan before it starts! I honestly think that was the only reason I was able to keep going. 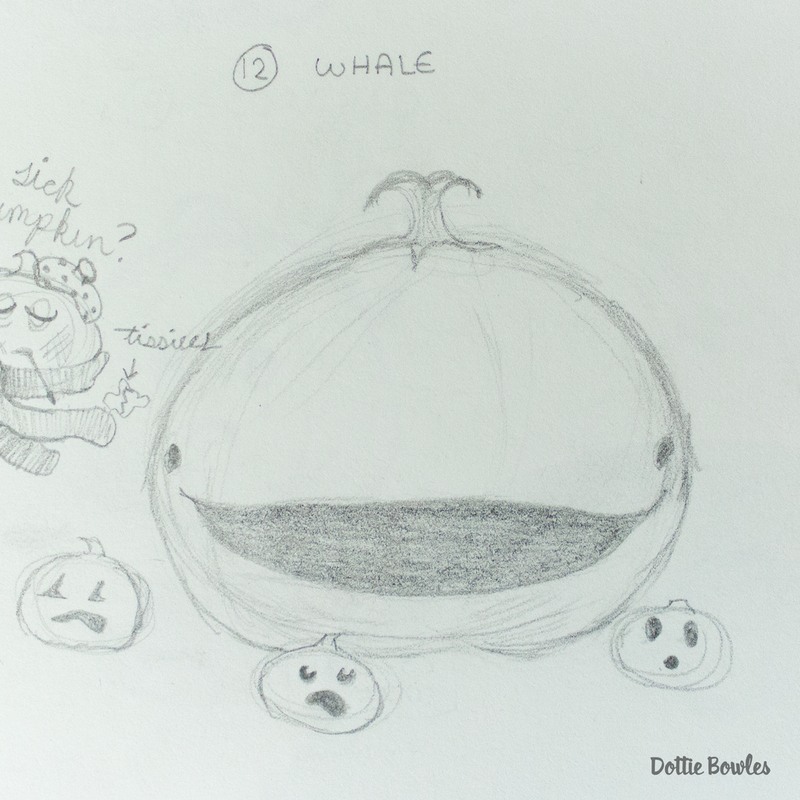 On any day I felt like "Okay this is a bit too much, I might tap out" I'd look at my planned sketches and think, "Oh but then I won't get to make this pumpkin!" I hope you guys enjoyed seeing behind the scenes of my Inktober! If you followed along during Inktober thank you so much for the support!